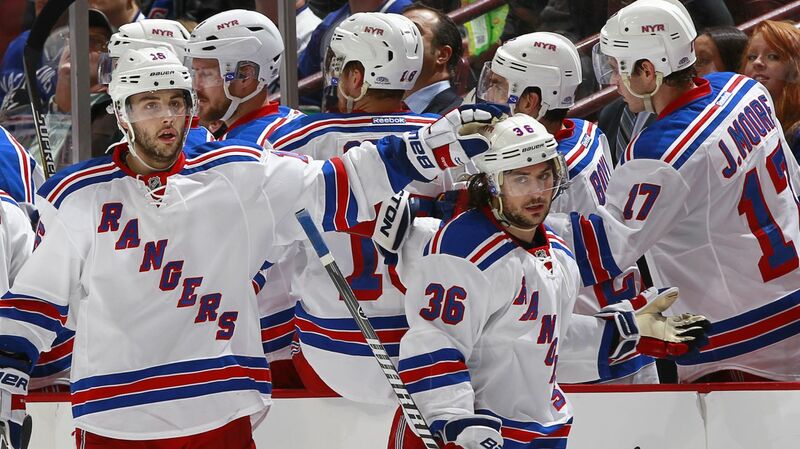 The Rangers celebrate one of Mats Zuccarello’s two goals against the Canucks. 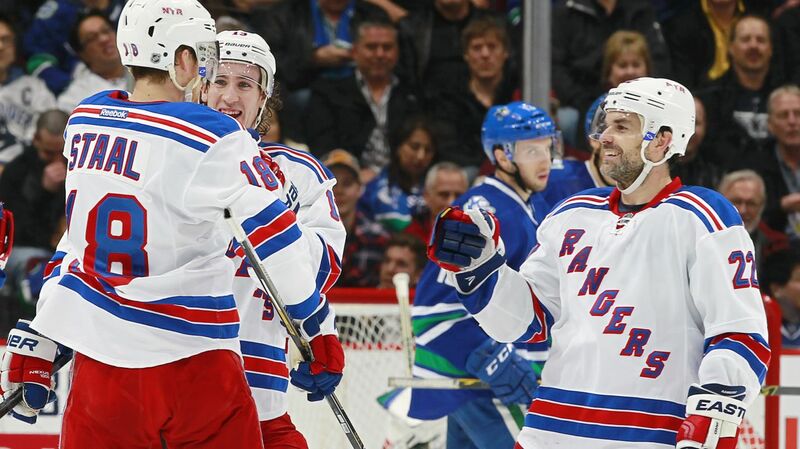 The Rangers cruised to a 5-1 victory in Vancouver. Photo courtesy of Getty Images. 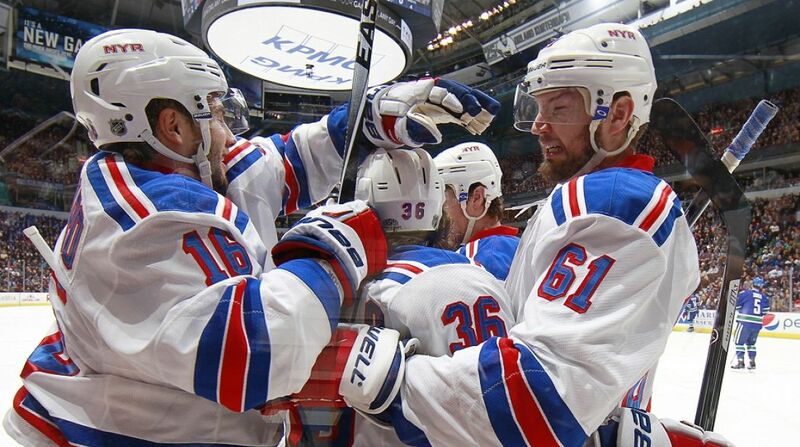 Despite having a five day gap in between games, the Rangers (13-10-4) had a very complete effort in a win over the struggling Vancouver Canucks (18-10-2) on the road. The Rangers dominated the game from the start, scoring three goals on their first four shots of the game. The Rangers first two goals came within 43 seconds of each other. Ryan McDonagh looked like the player he was last year out on the ice. McDonagh scored the Rangers first goal, which was also his fourth of the season. He also had a plus-four rating and blocked three shots. JT Miller continued his streak of good performances, scoring again after a nice feed from Derek Stepan. Miller has been on the Rangers second line for the past two games, and has scored in both games. He now has three goals on the year and will likely continue to play as a top six forward. Marc Staal had a very strong game for the Rangers, playing very well defensively throughout the game. Staal also scored his first goal of the season on a slap shot past a screened Ryan Miller. Marc Staal had a very good game for the Rangers both defensively and offensively, as he scored his first goal of the season on a slap shot from the point. Photo courtesy of Getty Images. 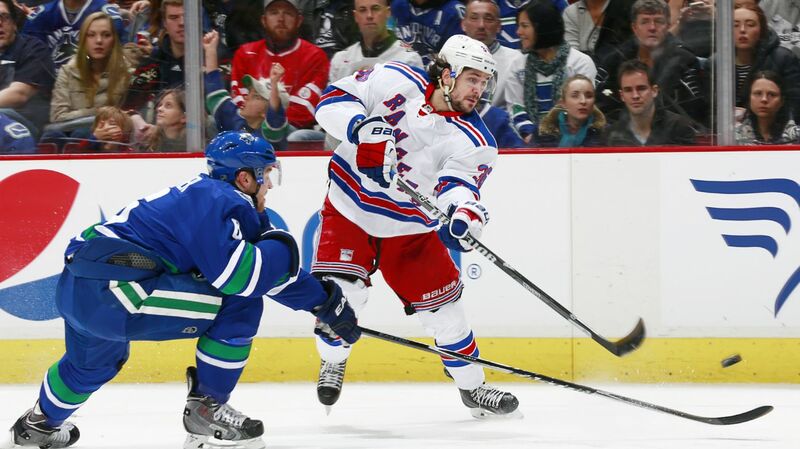 Mats Zuccarello was the offensive MVP of the night, scoring two goals to help propel the Rangers past the Canucks. Zuccarello was very strong tonight, connecting on both of his shots and finishing with a plus-two. It was an important rebound game for Zuccarello, who had been struggling to score but has played much better in the last few games. Rick Nash and Derick Brassard both had assists both of Zuccarello’s goals, increasing their point streaks to nine games and five games, respectively. Nash’s two assists also put him at 30 points this season. Ryan Miller really struggled, allowing three goals on his first four shots that he faced, and five goals on the first 16 from New York. The lone goal for Vancouver was scored by Nick Bonino. On the other side, Henrik Lundqvist was strong. Lundqvist was not tested much early, but stopped all 15 shots from the Canucks in the third period. Lundqvist finished with 29 saves and his 11th win of the year. henrik Lundqvist was strong in net for the Rangers, making 29 saves en route to his 11th win of the season. Photo courtesy of Getty Images. The game started out with an early chance for the Canucks. Dan Boyle made a bad turnover that went right to Nick Boninio, but was able to recover and prevent a quality shot. After that turnover, the Ranger really smartened up and played much better. The Rangers broke through first in the game, and it was the Captain Ryan McDonagh scoring his first goal of the season. The play started with Dom Moore making a nice play along the boards to chip it to Jesper Fast for a 3-on-1. Fast took it down the wing, and patiently waited for a lane to open up. 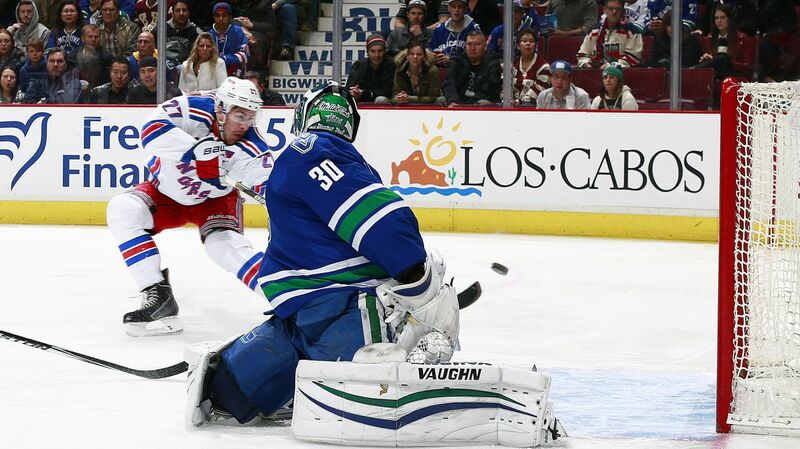 McDonagh was on the receiving end of the past, and was able to get it past Miller to give the Rangers a 1-0 lead. McDonagh had been struggling a bit lately, so having such a successful night is good for his confidence and may help him get back on track. Ryan McDonagh cashed in on a fantastic pass from Jesper Fast for his first goal of the season. McDonagh was also strong defensively, and was one of the best players on the ice tonight. Photo courtesy of Getty Images. The Rangers were not finished after McDonagh’s goal. Just 43 second later, JT Miller scored his fourth goal of the season after a nice move to get past Ryan Miller. Martin St. Louis was able to chip the puck out to center, where Derek Stepan collected it for another odd man rush. Stepan made a nice pass to Miller, and he deked the puck past Miller, giving the Rangers a quick 2-0 lead. Miller has been taking advantage of his time on the second line, and now has goals in two consecutive games. JT Miller scored for the second straight game, using a nice move to get the puck past Ryan Miller. JT Miller has been very good in the past five games ,taking advantage of his opportunities on the second line and back at his natural position on the wing. Photo courtesy of Getty Images. The Rangers scored their third goal in less than seven minutes off of another odd man rush, and this time it was Mats Zuccarello scoring on a wrist shot. The play started with Lundqvist making a great right pad save on Radim Vrabata. Derick Brassard was able to chip the puck out of the Rangers zone, and Nash made the pass to Zuccarello, who fired a wrister off of the inside of the post and in. The Rangers had a very quick 3-0 lead. The assist extended Nash’s point streak to nine games, which is the longest point streak by a Ranger since Scott Gomez had a 13 game point streak in the 2007-08 season. Brassard also extended his point streak to five games. The Rangers dominated the rest of the period, getting a few more opportunities and shutting out the Canucks. What was most impressive was the play of the defense. The Rangers defensemen were forcing turnovers, blocking shots and passes, controlling the neutral zone, and even scoring. Every skater was making smart decisions and helping contribute towards a victory. Derick Brassard picked up an assist on both of Mats Zuccarello’s goals, extending his point streak to five games. Brassard has two goals and five assists in that span. Photo courtesy of Getty Images. The second period was mostly the same story for the Rangers. MSG broadcaster Joe Micheletti noted that the Rangers were “not allowing Vancouver to get anything started,” and there was “no space or time in the neutral zone” for the Canucks. Marc Staal scored the Rangers fourth consecutive goal with a huge slap shot from the point. Lee Stempniak won a puck battle in front of the net, getting the puck over to Kevin Hayes. Hayes patiently waited for a lane to open up, and when it did, he fed the puck to Staal for the shot. It was Staal’s first goal of the season, and Hayes’ assist extened his point streak to five games. Hayes played well again, forcing a few turnovers and playing well with the puck. The only thing he needs to improve on is when to shoot in some situations, but he played very well again. Martin St. Louis had a breakaway chance in the second period, and managed to earn himself a penalty shot as well as getting a quality shot on goal. St. Louis was unable to lift the puck over the pad of Miller on the penalty shot. St. Louis is surprisingly 0-7 in his career on penalty shots. Following the penalty shot, Mats Zuccarello scored on one of the prettiest passing sequences from the Rangers this season. It was Zuccarello’s second goal of the night. Mats Zuccarello scored his second goal of the night after a great passing sequence from Derick Brassard and Rick Nash. Zuccarello now has six goals this season. Photo courtesy of Getty Images. Derick Brassard passed it to Rick Nash at the Canucks blue line. Nash heard Brassard yelling that he was coming back, and made a fantastic spinning pass to Brassard, who made a great pass to a streaking Mats Zuccarello for a tap in. It was Zuccarello’s sixth career two goal game. The second period came to a close, and the Rangers were up 5-0 in a dominating first two periods. 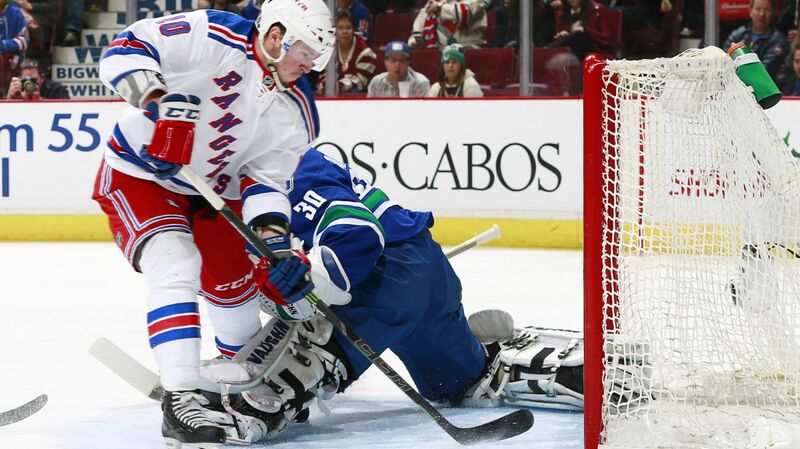 The Rangers were shutting down the Canucks and practically cruised through the first 40 minutes. In the third period, the Rangers played much more conservatively. 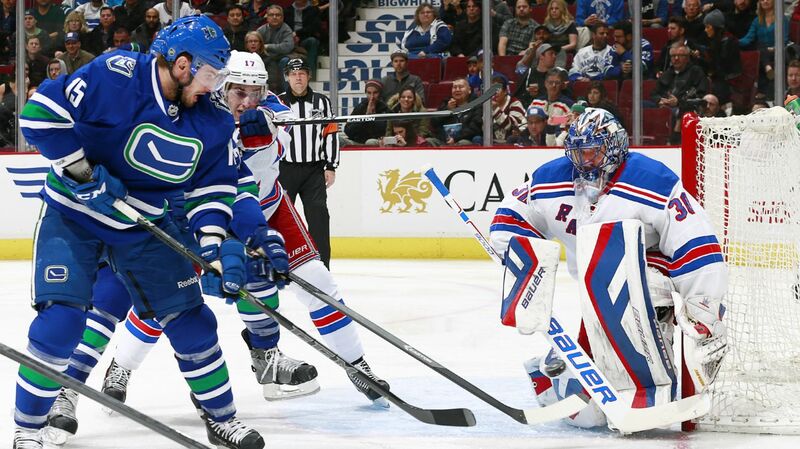 The Canucks were able to score one, with Nick Bonino firing a wrister over the glove of Henrik Lundqvist. But that was all that they could muster, and the Rangers walked away with a satisfying 5-1 victory. For the Rangers, it was exactly how they wanted to start off their road trip. The Canucks are a solid team, and a controlling win like tonight’s victory instills some confidence in his Rangers before they travel to Edmonton. Mats Zuccarello scored two goals in the win tonight, giving him six on the season. “Zukes” was one of the struggling Rangers in recent games, so hopefully a game like tonight’s helps establish consistency in his play. With Kevin Klein leading Rangers defenseman in scoring, there was probably some pressure on the other guys to score. Ryan McDonagh and Marc Staal both scored their first goals of the season, which takes some of the weight off of their shoulders. When scoring comes from all over the ice, the Rangers have a better chance at winning. JT Miller continues to play well since being recalled. Miller remained on the second line and scorred again. I would expect Miller to play alongside Stepan and St. Louis against Edmonton as well. Overall, it was a near perfect game for the Rangers. They won a lot of puck battles, scored quickly and early, forced turnovers, and shut down Vancouver for most of the game. The team played very smart and converted on the opportunities that were presented to them. The Rangers will look to carry over the success from the win over the Canucks game, when they head into Edmonton to take on the struggling Oilers (7-18-5), who have just one win in their last 15 games. The Oilers beat the Rangers on November 9th by a final score of 3-1. Posted on December 14, 2014, in Game Recaps and tagged Alain Vigneault, Anthony Duclair, Carl Hagelin, Chris Kreider, Dan Boyle, Dan Girardi, Derek Dorsett, Derek Stepan, Derick Brassard, Dominic Moore, Edmonton Oilers, Henrik Lundqvist, Jesper Fast, John Moore, JT Miller, Kevin Hayes, Kevin Klein, King Henrik, Madison Square Garden, Marc Staal, Martin St. Louis, Mats Zuccarello, Matt Hunwick, MSG, New York Rangers, NHL, NHL 2014-2015 Season, NY Rangers, NYR, Rangers Nation, Rangerstown, Rick Nash, Ryan McDonagh, Ryan Miller, Taylor Hall, The Duke, The Ranger Zone, Vancouver Canucks. Bookmark the permalink. Leave a comment.